TOKYO – Asian stocks turned lower on Thursday and the yen surged after the Bank of Japan refrained from taking further stimulus steps, hours after the Federal Reserve’s own review had struck a cautious note on its policy outlook. The dollar was already under pressure after the Fed left interest rates unchanged overnight and became slightly less hawkish. While signaling that it still expected two rate hikes this year, the Fed also said slower economic growth would crimp the pace of monetary policy tightening in future years. Spreadbetters expected Europe to follow Asia’s lead and saw a lower open for Britain’s FTSE, Germany’s DAX and France’s CAC. The BOJ kept monetary policy steady and stuck to its optimistic view of the economy on Thursday, even as renewed yen rises and slumping stock prices threaten to derail a fragile economic recovery. While the BOJ’s decision did not come as a big surprise, expectations that the central bank will take action next month increased. But for now uncertainty over whether Britain will vote to quit the European Union is strengthening the yen because of the Japanese currency’s safe-haven status. “The Bank of Japan are in a pickle and more than most will be really hoping that the UK don’t vote to ‘leave,’ or USD/JPY will be trading below 100 yen and they will have to do something amazingly punchy just to stabilize assets,” wrote Chris Weston, chief market strategist at IG in Melbourne. MSCI’s broadest index of Asia-Pacific shares outside Japan was last down 0.9 percent. 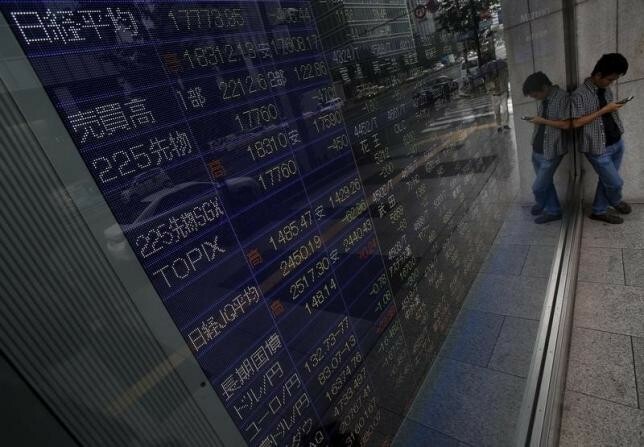 Japan’s Nikkei hit a two-month intraday low and was last down 2.6 percent. South Korea’s Kospi lost 0.8 percent and Hong Kong’s Hang Seng dropped 1.9 percent. On the whole, investors were still cautious on worries Britain may vote to leave the European Union, which saw US stocks fall for a fifth straight session overnight despite the Fed’s subdued view on interest rates. While the US central bank kept policy steady as widely expected and lowered its economic projections, it did signal that it still planned to raise rates twice in 2016. However, the Fed’s conviction appeared shakier with six of its 17 policymakers projecting just one increase this year. Only one Fed policymaker had done so when economic forecasts were last issued in March. “Although the Fed’s projection tout two rate hikes, a rate hike in July is highly unlikely, which makes it questionable whether the Fed can raise rates twice in its three policy meetings left by the end of year,” said Daisuke Uno, chief strategist at Sumitomo Mitsui Bank. The greenback was down 1.5 percent at 104.400 yen after hitting 104.320, its lowest since September 2014. The yen also hit its highest level since January 2013 against the euro and a four-year peak versus the Australian dollar. The euro inched up 0.1 percent to $1.1272 after gaining 0.5 percent overnight. The 10-year Treasury note yield slipped to a four-month trough of 1.545 percent and added pressure on the dollar. The recent bout of global risk aversion generated by Brexit fears have boosted safe-havens like government debt, sending the German and Japanese benchmark 10-year yields to record lows this week. The Brexit concerns also saw US crude oil fall 1 percent to $47.52 a barrel, on track for a sixth straight day of losses. Brent crude was down 0.8 percent at $48.59 a barrel.